In the wake of a disaster—an earthquake in Nepal, a tornado in Oklahoma, a typhoon in the Philippines—some nonprofit organizations must launch into motion within hours. It’s a blur of action. Get a campaign page up, spread the word, and rush to fundraise. The whole process leaves some nonprofits feeling anxious, but if you have the right components in place, emergency fundraising can be a swift and efficient effort. Yes, even an emergency campaign requires a plan. When you have to act fast, preparedness and communication are key. With a plan, you’ll feel more confident that you can mobilize supporters quickly to begin relief efforts immediately, rebuild for the future, and eventually resume programs as normal. Choose one point person or decision maker. This person will immediately assess the needs on the ground, establish a fundraising goal, and delegate the communications and fundraising strategy to other team members. It’s useful to have a standard protocol for emergency situations, so that the decision maker has a clear path to follow and can take action as soon as possible. A spokesperson acts as a liaison between the decision maker and periphery parties like volunteers or the media. Social media plays a big part in disaster communications. The social media coordinator educates followers about events unfolding on the ground and spreads the word about your campaign. They will keep your followers in the loop about constituents’ greatest needs and how your organization’s work is progressing. After you’ve launched your fundraising campaign, engage followers on progress towards your goal. Create a unique donation page for the emergency you’re addressing. It’s important that the page be specific to your efforts. Give donors the reassurance that their donations go towards the cause that initially brought them to your organization—the immediate need. Boilerplate text about your organization’s work in each region. It takes time to write and edit good copy, so have critical text available for when you need it. Over time, update the campaign page to describe what has been accomplished so far and why you need continued support. Bonus: Set up a peer-to-peer fundraising campaign to amplify the impact of your supporters. 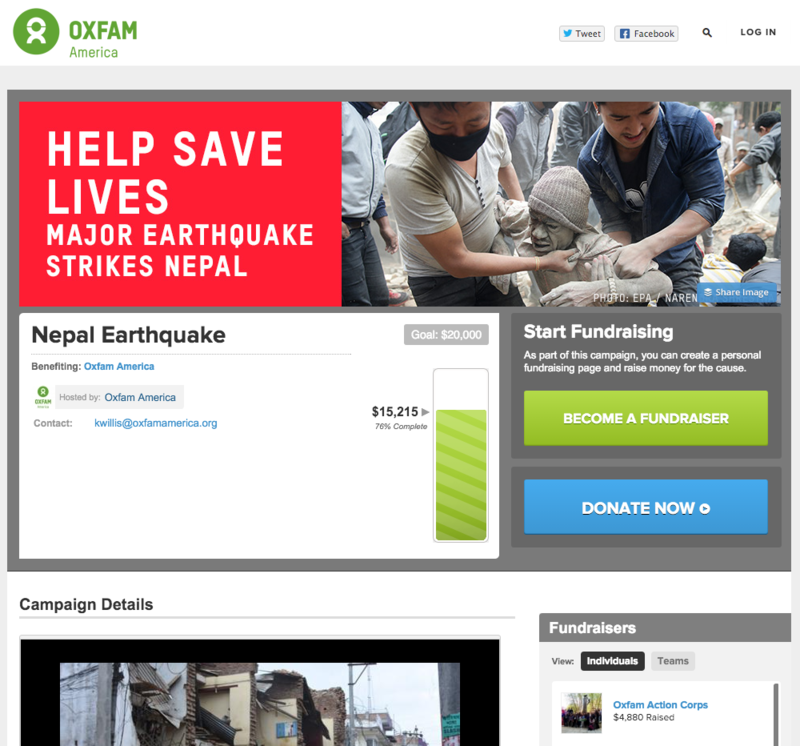 Here’s an example from Oxfam, whose top fundraising team raised nearly $5,000 and top fundraiser brought in $1,400 during their Nepal Earthquake relief efforts. Prepare to send update emails frequently, especially in the first month. Outline the types of emails you’ll need to write so the communication strategy and frequency is clear from the get-go. You can even design email templates ahead of time and have them ready for use at a moment’s notice. First update – Send an email to anyone who donated to your campaign in the first week after a disaster. Thank them for their support and describe what their donation is doing for relief efforts. Update them on the progress you’ve made toward your goal. 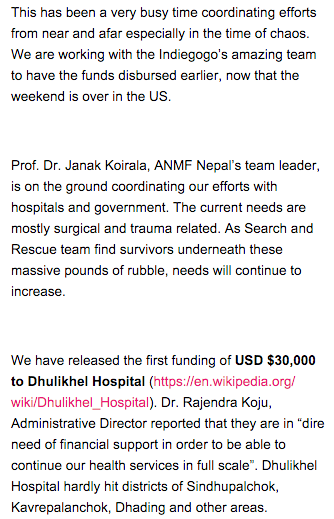 This update from America Nepal Medical Foundation presents the point of view of experts on the ground, next steps, and how money is already being used for critical needs. New appeal – Don’t be afraid to ask for another donation. It takes months, if not years, to recover from a disaster and after media attention wanes it can be difficult to garner new support. Here’s an example from Action Against Hunger. 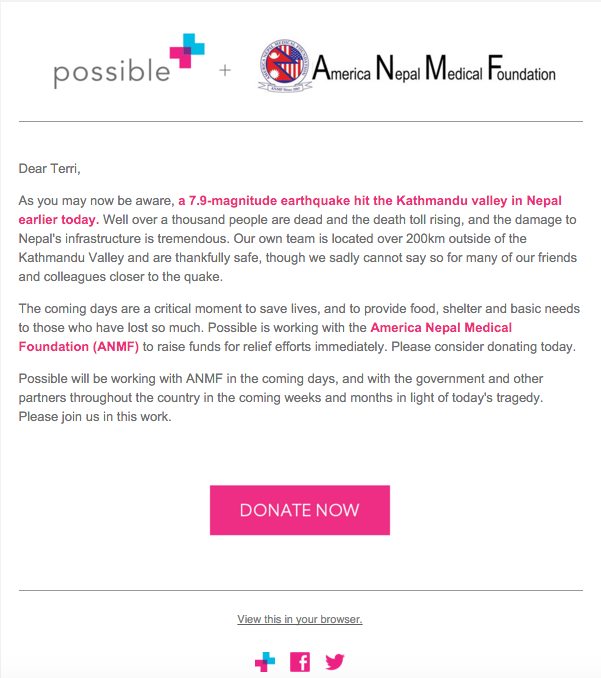 As soon as the second earthquake hit Nepal, they sent another appeal email. Campaign updates – if there are any major changes to your campaign, announce them to your supporters. These can include milestones hit, immediate action needed, or time-based match periods. 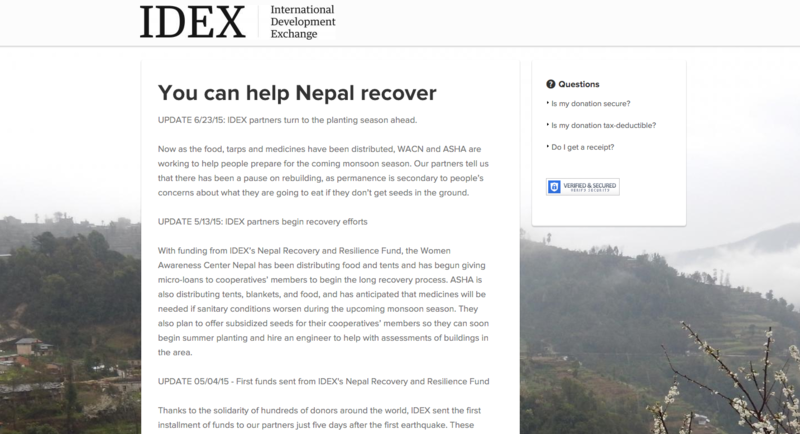 If you can motivate supporters to maintain their involvement in relief efforts, send the email. Full campaign follow up – As efforts move from immediate relief to rebuilding efforts, make sure to keep supporters in the loop. They’ll want to know how money was spent, what progress has been made, and how the future looks for constituents. Before setting up your campaign, assess the situation on the ground. Gather as much information as you can about damage and needs. Are any numbers or estimates available? Are any staff members able to provide first-hand photos? 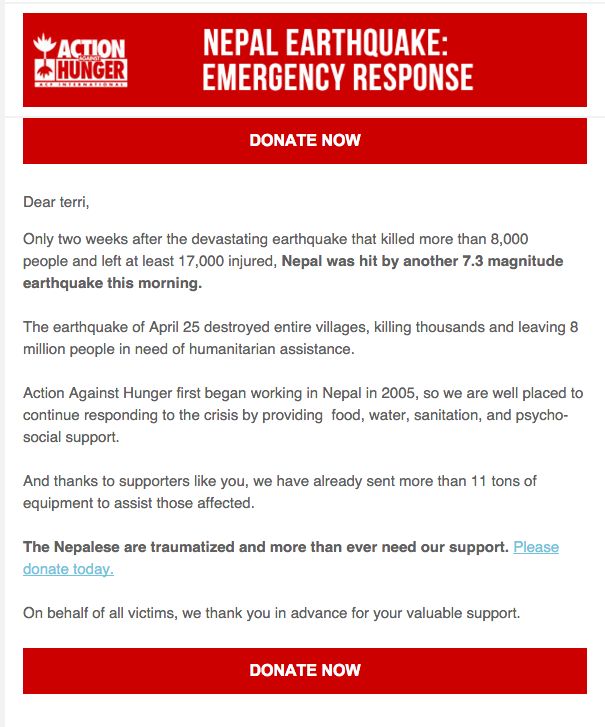 Write and set up a tailored thank you email for donors to the emergency campaign. This is where having templates created and saved in your email marketing platform really come in handy. Use that information you gather as a starting point for your campaign page. Include the most pertinent information and ask donors to follow your social channels to stay up-to-date on the situation. Include a link back to the campaign page so donors can easily forward the email along to their networks. Update your campaign page description to include any new information you have about the situation, new photos, and what you’ve achieved so far. 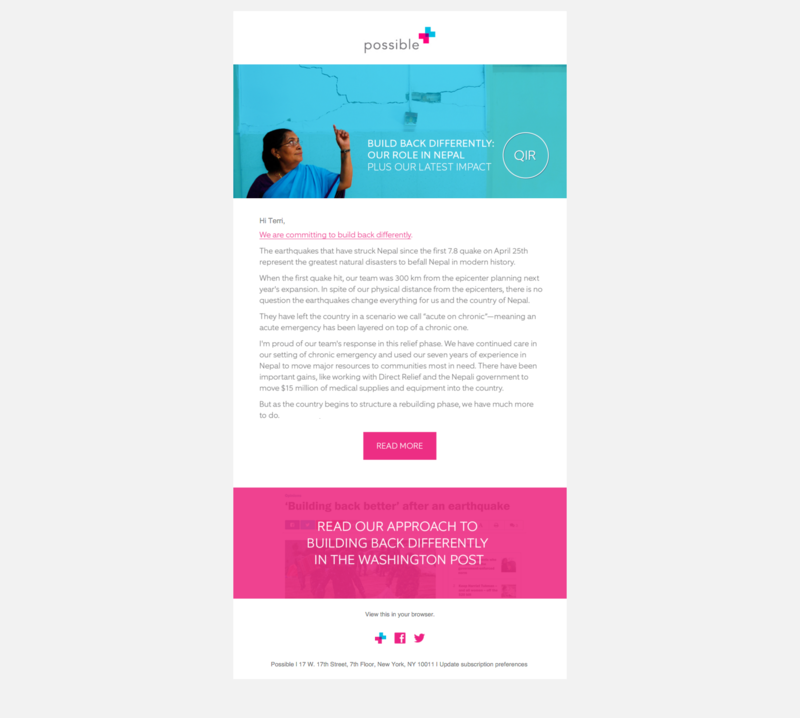 Continue to segment email communication between donors to your emergency campaign and non-donors. You’ll want to keep all types of supporters in the loop, but it’s important to tailor how and what you communicate to each group. Did the disaster change your organization’s mission in the region? What is your short term goal for rebuilding? Your long-term vision? How will your programs be affected moving forward? Here’s a great example from Possible’s response to the Nepal Earthquakes, about a month after they happened. The email came directly from Mark Arnoldy, the organization’s CEO. No organization wants to be faced with fundraising for a natural disaster, but should the event arise it pays to be prepared. Maintain transparency with donors about the needs on the ground and the progress you’ve made, or the challenges you face, and you’ll find them motivated to maintain their support. Don’t want to forget a thing? Download this checklist and keep it on hand.